Clean Teeth At BLC From Service Tour! 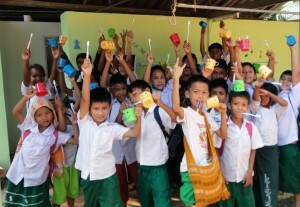 The students at the BLC are now brushing their teeth each afternoon thanks to The Hilversum International School! This group of high school students came to the center as part of their study and service tour this past February. After only one day at the center, they realized that many of the children eat sweets after lunch and have rotting teeth. The decided to initiate an additional project to focus on dental hygiene at the school, and make a lasting impression of this service tour. At first it seemed like a big challenge as they were told that other group service tours have given toothbrushes, but the projects did not succeed because of students losing the toothbrushes. They used critical thinking and adaptive skills to plan a more sustainable dental hygiene project that focused on making time and space for the activity. Both the teachers and students generously donated additional money to cover the cost of tooth brushes, tooth paste, cups and piping to make a safe place to hang the brushes each day. They started the program off with a fun song about washing hands and brushing teeth before they helped the students with their first time brushing their teeth after lunch. The teachers and older students have now helped to make this a daily activity and the students are all brushing their teeth after lunch! Special thanks go to Srishti and Godert for helping to plan this project and see it through to a successful completion!